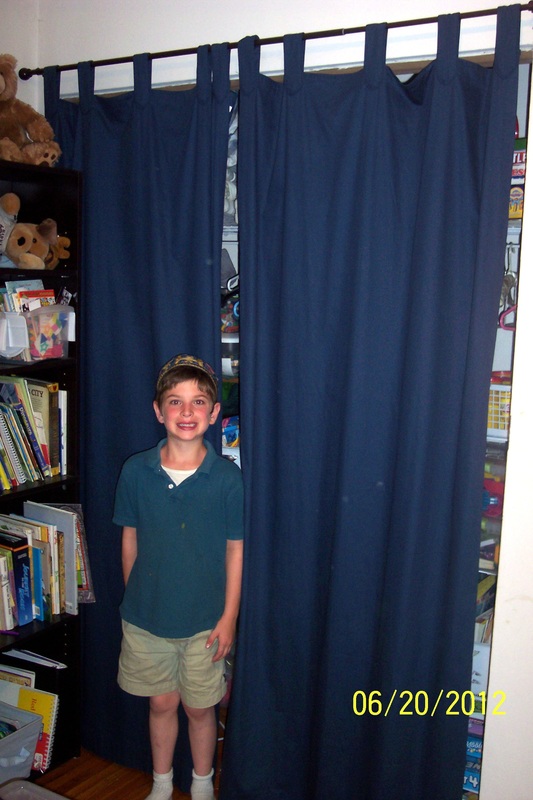 From the day we moved into our house, our older son’s closet doors have not worked right. The doors hit each other in such a way that the handle/knob on one side was bent back. We could never get to the middle part of the closet directly because the doors overlapped. Then the doors came off track and we couldn’t fix them. Luckily, my neighbor and good friend, Bella, had a great solution. 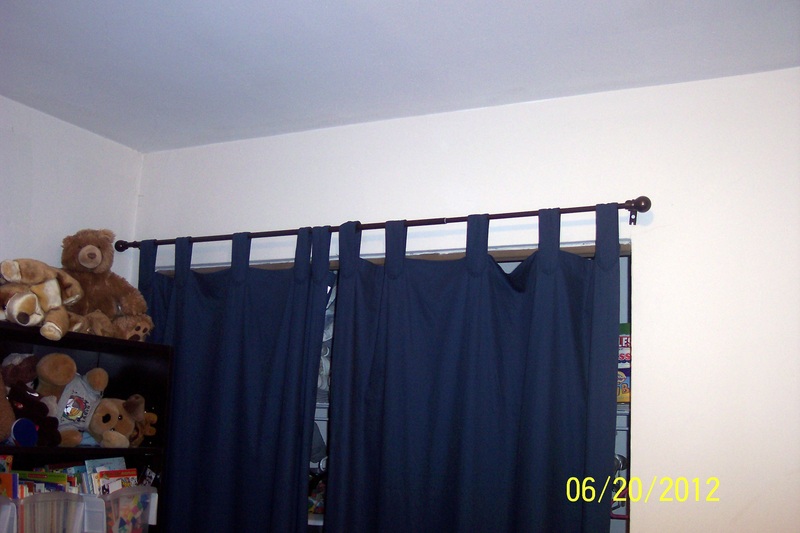 She hung curtains in place of the doors. Her daughter picked out a color to match her bedroom decor and voilà, perfect solution. Well, when the door came literally off its track and hinges, we had no choice but to do something. We couldn’t afford new doors and installation and certainly didn’t want the same doors put back. So we opted for this great trick. Now we can easily get to everything in the closet and it looks nice! Do you have any tricks you have used to cheaply fix a home décor problem in your home? Please share in the Comments section. If you want to send a picture and description to me, please email me! Super cute. Ingenious Idea; especially for kiddos to see all their wonderful “stuff.” It looks like it also solves the “dark scary closet” syndrome. Thanks! It really worked out well and saved us so much! It is a lot easier to get to his things, too. Now if we could just get him to put his things away instead of leaving them on the floor or bed! Rachel, have you written any books yet? I know with all you’ve posted on Facebook, you could easily compile, copywrite and publish…and be paid for all these great suggestions, all the good advice you give about anything imaginable. And I NEVER had any idea there were so many different Israli Religious Holidays and explanatories for so many English words. You’ve always been a special person. I was so glad to learn that you had “all” your children because I could see the love and compassion you had for my granddaughters, when we’d be a Mom’s for a special meal and the girls could hardly get thru Mom’s door, before you grabbed one up (sometimes both) and believe me, the girls were not happy with just anyone. So I really felt very good and full of love for you for being the way you are. I read all your posts and wonder how you get so much done with all the boys. God is surely the most important in your life as you share your time and feelings with them and others in need. It’s just too bad there is only one of you…you are truly unique…I just didn’t know how much. You were so “quiet” as a teenager, it wasn’t easy to get to know you so well, and then there didn’t seem to be enough “family” time either. I do wish you, your husband and your blessed sons the best God has to offer on this earth because surely you “earn” it everyday, not in an “expectant” manner but just to “give” of yourself. Thank you so much for your nice words. I miss you, too, and am glad that thanks to our digital world, we can still keep in touch!